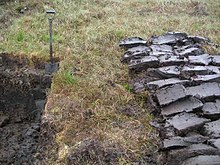 Peat, an aa cried turf or truff, is an accumulation o pairtially decayed vegetation or organic matter that is unique tae naitural auries cried peatlands, bogs, mires, muirs, or muskegs. ↑ Joosten, Hans; Clarke, Donal (2002). Wise Use of Mires and Peatlands: Background and Principles including a Framework for Decision-Making (PDF) (Report). Totnes, Devon. ISBN 951-97744-8-3. ↑ Hugron, Sandrine; Bussières, Julie; Rochefort, Line (2013). Tree plantations within the context of ecological restoration of =peatlands: practical guide (PDF) (Report). Laval, Québec, Canada: Peatland Ecology Research Group (PERG). Retrieved 22 February 2014. This page wis last eeditit on 26 Apryle 2018, at 23:45.